Transformation Tuesday with Natalia DiMiceli! Natalia is NOT dieting... she is changing her lifestyle!! I LOVE this! So important to acknowledge the lifestyle change.... this is what it's all about! Hi-Fives to you Natalia, you must feel amazing and you look spectacular! I'm 29 years old. I'm currently doing the beach body guide by Kayla Itsines. I've always are whatever I wanted and felt guilty after. Anything that came easy to me. I started following the HELP Nutrition Guide by Kayla Itsines for 30 weeks now. I like watching football and hockey but I don't play sports anymore. I love fitness, yoga and graphic design. I also love to write and inspired others to live a positive life and love yourself. This journey is more than just having a bikini body. We all have different shape of body and we will find ourselves blooming differently. Fitness and healthy eating has played an important role in my life. Before this journey I didn't like my body because 1. I have a scar on my abdomen which made me so uncomfortable while I was overweight as Its stitched into the muscle. It became hard to breath and forget about how I felt about the look of it. 2. My upper body is bigger than my lower body. 3. I barely have hips 4. I'm petite and look like I'm 12.. The list went on and on and all I did was torn myself apart finding everything "wrong" with me. It's so sad to think that majority of girls think like that of themselves. We tend to see images online and magazines that portrait the perfect image and we all wish we look like that. Do not think of yourself more highly than you ought, or put yourself down with irrelevant images and thoughts but rather think of yourself with sober judgment, in accordance to what you have been given. The most important and amazing thing I've gained from this journey is to accept myself but the most fantastic discovery is that I can breath without discomfort and I'm not longer allergic to fruits, vegetables and season allergies. That's what fitness and living a healthy lifestyle did for me. Idk but ever since I changed my lifestyle I feel good internally. I also feel more energetic, happy, stronger and positive. This is my new lifestyle and not a temporary change... My goals are to raise my daughter to value the important things in life and look at me and be proud. This journey is more than just having a bikini body or muscular body. It's the strength that I'm able to gain mentally and physically. The strength that I get every morning and night to continue living a positive life. The courage I find within myself to try new things that will improve my way of living. The satisfaction I get from completing every workout and the feeling of being able to accomplish something I never thought was possible after giving birth. More and more women are embracing their strength and that's incredible to see. I love being part of this fitness community. Natalia that is absolutely AWESOME! Your daughter will definitely be proud! Always remember, it is your motivation that kicks starts this lifestyle change BUT it is the habit that keeps you going!!! 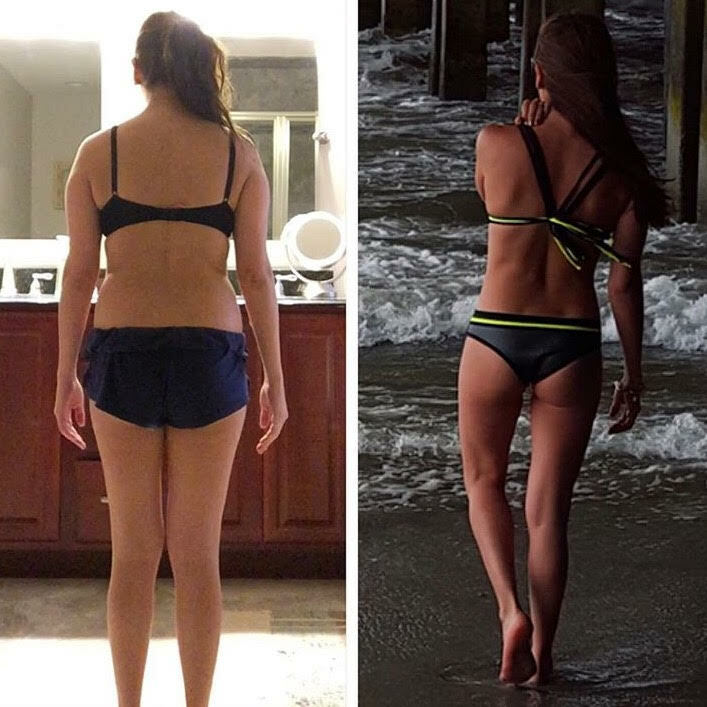 Make sure you follow Natalia on @fitbynati to see her amazing progress!